A Decline in Evangelical Christianity in America--Why? Gallup has just published its annual survey on how Americans view various professions, and the results are not pretty for clergy: Americans rating of the honesty and ethical standards of clergy is at an all time low. 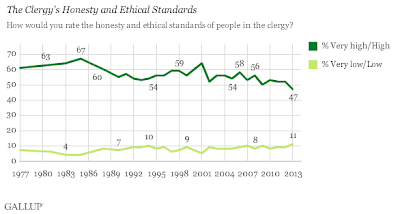 In fact, recorded public trust in clergy has now reached an all-time low, with only 47 percent of Americans rating clergy highly on honesty and ethics (compared to 82 percent saying the same about nurses). The previous low since Gallup began asking the question in 1977: 50 percent in 2009. William Lane Craig has a short essay on the Fox News blog that it getting a lot of attention from the atheist blogosphere--which is not surprising since the essay is entitle "A Christmas gift for atheists -- five reasons why God exists. I personally find these proofs of God a fools errand. We are kidding ourselves if we think we can "prove" that God exists. At best, we can come up with reasons for why our faith is reasonable and consistent with existing scientific evidence. If we are honest, however, we must admit that for each of our asserted reasons for belief there may well be a materialistic explanation that does not depend on a supernatural being. For example, humans do seem "hard wired" with some moral sense that transcends cultural differences, but this may well be the result of natural selection for this trait. As a social animal, humans with an altruistic sense were more likely to survive. Generally, thinking about eschatology (the study of end times) divides into four camps. First, there are the alleged literalists. These Christians claim to accept Biblical teachings about the end of history at face value. . . .
Second, some Christians argue for a realized eschatology, i.e., Christians experience the future return of Christ (aka his second coming) in the sacraments and sacramentals. This view's popularity perhaps peaked in the first half of the twentieth century. . . .